Kilowatt is the unit of power. It is the product of voltage, ampere and power factor. It is also called as real power. One kilowatt(kW) is equal to thousand watts(W). Kilo volt-ampere is the unit of apparent power. It is independent of power factor. One kilovolt-amp(kVA) is equal to thousand volt-amp(VA). How to convert kilo-volt-ampere to kilowatt? To convert kilo-volt-ampere to kilowatt, multiply the KVA to the power factor of the circuit. 1. 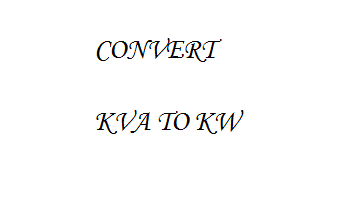 How to convert kVA to kW? 2. kVA to kW convertor online.